A geodesic dome, is a partial spherical structure, which encloses space. The geodesic dome’s design stems from a regular Icosahedron (interlocking pentagons making up 20 equilateral triangles) projected to create an approximated sphere. Geodesics are a network of great circles on the surface of a sphere, which intersect to form a lattice of triangles that closely and smoothly approximate to a sphere and help distribute stress across the structure. 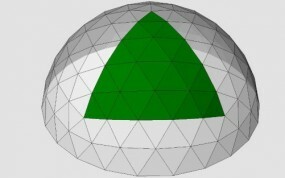 A Solardome® geodesic dome typically has five geodesic patterns that repeat around the top of the dome. Why is a geodesic dome so strong? It is the strength and rigidity of the various sized triangles over a spherical frame that allows even distribution of stress across the structure. The resulting dome is incredibly strong, whilst requiring the minimum amount of material possible. Solardome® geodesic domes are constructed from an aluminium frame and toughened glass cladding meaning they are very light but at the same time extremely robust and can withstand extreme wind and snow loadings. 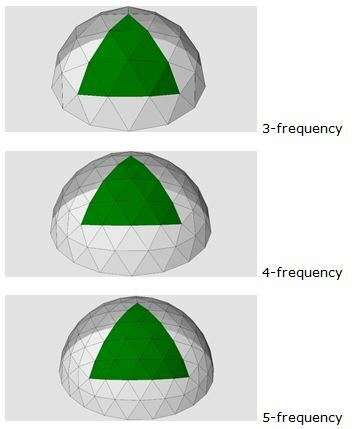 The term ‘frequency’ relates to the shape or smoothness of the dome. The higher the frequency, the more triangles it has, and so the closer the dome it is to a true sphere. To find the frequency of the geodesic pattern, simply count the number of struts between the centres of two adjacent pentagon patterns. The top of each dome forms a pentagon (the five glass triangles around the apex), another can be found next to a door. Then count how many struts are between the centres of these pentagons – this number is the dome’s frequency. Our standard glasshouses range from 2-frequency to 6-frequency. Our SOLARDOME® PRO system ranges upwards from 4-frequency. Our outdoor living standard domes comply to, and exceed British wind and snow loading standards. No other glass building is as strong in extreme weather conditions. Please ask if you would like to see our certificate of design conformity or our structural analysis. All bespoke SOLARDOME® PRO domes (over 7.2m diameter) are structurally engineered to Eurocode standards and to meet individual wind and snow loadings. Our standard Solardome® glasshouses are made from non-corrosive mill-finished aluminium profiles (79% recycled) and 4mm toughened glass known for its clarity, long life and strength. They have a white powder coated finish to all exterior surfaces and all fittings are stainless steel to prevent rusting or moss build up. Silicone sealant and ultraviolet stable plastic glazing strips provide a weather-tight seal. At the end of the domes long life, they are almost completely recyclable. Our SOLARDOME® PRO system is constructed from purpose designed mill-finished aluminium profiles (alloy 6082 T6) for the strut and link arm section with a unique Geo-Lok aluminium nodal clamping mechanism. Structural silicone and glazing tape hold the glass panes in place, and are sealed with weatherproof sealant resistant to ozone, ultraviolet, and temperature extremes. Double glazing – dependent upon your chosen specification. U values of around 1.2w/m² can be achieved. We can also add safety film internally to create a laminated panel if used as a skylight. Other – any material up to 100mm thick can be accommodated i.e. wood, metal composite or insulated panels (U values down to 0.35 w/m²). Insulation and/or acoustic materials can be fitted on the inside if required. Do the glass panes break easily? All our standard glasshouse domes come 4mm toughened glass. Panes of glass rarely break, even in hurricane force winds, due to the unique way the glass is held in the triangles and is never under tension. It is much stronger than a standard glasshouse and can generally withstand stones being thrown at it from distance and a ball hitting it. Solardome® geodesic domes have been in production for over 40 years and the original models across the country are still going strong. Our geodesic domes are made with non-corrosive materials, are virtually maintenance free and should last several decades if looked after as per our recommendations. They can even be dismantled and rebuilt making them very cost effective over their lifespan.